Expand search to view more listings in and around Mountlake Terrace. See more offices in and around Mountlake Terrace. 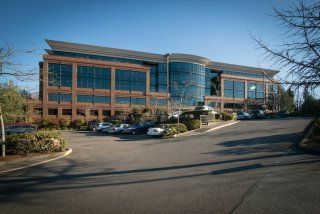 We now have 1 executive office building in Mountlake Terrace, Washington in an ideal business location, which we can offer on an easy move-in, move-out basis and providing your company with the flexibility you need to get up and running in Mountlake Terrace. Offices.net is here to provide an extensive range of competitively priced, executive, fully-equipped office space in Mountlake Terrace, Washington, on terms to suit your business' needs. You will be spoilt for choice when it comes to impressive business services and professional support services in Mountlake Terrace. We endevor to ensure that the whole process is as easy as possible for the companies we assist. Numerous business centers listed on Offices.net come inclusive of a range of support services consisting of dedicated front desk reception and building security, conference suites and lounge areas, dining facilities and break out areas. Additionally, numerous office buildings also include high speed internet and network wiring, free car parking lots, day and night access and onsite IT support staff. All you need to do is to choose one of the offices to rent in Mountlake Terrace displayed above. Every executive office suite, shared workspace and virtual office boasts a prestigious business position in Mountlake Terrace, on flexible rental terms to suit your business requirements. In addition, we have an impressive selection of prime office space in other Washington locations, available on flexible terms to suit your needs. For all your office requirements, contact us using the form or phone number above.